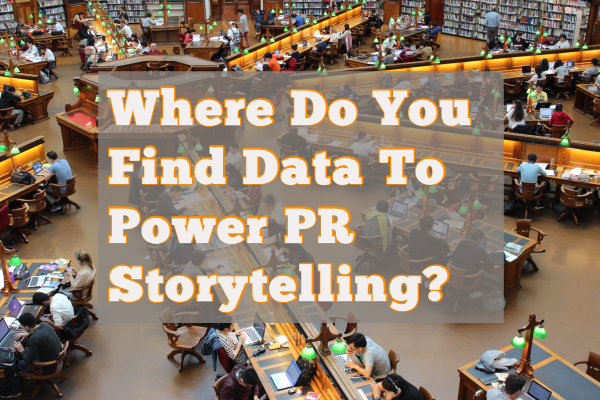 Where Do You Find Data For PR Storytelling? Last week’s post covered the trend of data-driven storytelling in PR. But where does the data come from? For many of our clients we field quarterly surveys designed to generate relevant news or insights. But there are lots of other options for PR pros to source relevant data, and many are inexpensive and fairly easy to find. Social monitoring and listening not only give us a heads up on customer service issues or negative PR, but they can illuminate industry trends and customer behavior. A PR campaign can include a general theme or direction found in social media data or patterns, or the social data can inform a content calendar. Social listening is also a great method for coming up with fresh ideas that will resonate with a specific target audience. Polls and surveys are time-honored PR tools for developing campaigns, fine-tuning messaging, and generating earned media and content. The survey possibilities are endless, but here are our favorites. They’re beloved among PRs because they’re quick and affordable. Unlike custom marketing surveys, they’re administered on behalf of multiple organizations, thus spreading the cost over many sponsors. A good omnibus is a solid way to inform thought leadership content or to grab relevant data to attract media interest. They can also be used like flash polls after a news event. If you’re a cybersecurity firm, a 1000-person survey conducted after a public security breach may show behavior change, persistent sloppy password habits or new attitudes about smart home devices. Whatever the outcome, it’s likely to yield fascinating material for content. Media love poll-results story pitches, especially when accompanied by visuals like infographics. See our earlier post for more on how to make surveys work for PR. Even a small company may have thousands of marketing contacts collected from CRM, website visits, and social followers. Social platforms like Hootsuite or a marketing one like Hubspot can collect, visualize, and collate data analytics on subscriber demographics, email engagement, website activity, and social engagement. If you do customer satisfaction surveys, you can throw in a question to support a specific storyline or uncover customer concerns useful for PR programming. A PR pro can find in-depth research online from many government and non-profit sources, all in the public domain. Data.gov, Healthdata.gov, U.S. Census Bureau, and other public agencies routinely produce data analyses and statistics collected over many decades. You can cherry-pick studies from different sources, combine and cross-reference to yield an original piece of secondary research – and a story. For a mattress company, we converted NIH data on how many hours people sleep every night into a branded national index of “most sleep-deprived cities.” Our out-of-pocket cost was $200 for the statistical software that made the calculations. They’re unscientific, but they’re cheap and easy. If you’re stuck for byline or blog ideas, you can always ask a handful of peers, customers, or sales reps for feedback on their biggest needs, concerns, or frustrations. The most cost-efficient are online tools like SurveyMonkey and Fieldboom for DIY polling. There are even smartphone apps like Poll Everywhere to facilitate more informal online polls with onsite participants at conferences and panels. The high-end method is a partnership with an industry analyst or research firm to create a piece of branded research as a corporate communications centerpiece. We helped a credit-union client with a financial literacy platform team with a trade group to develop a national financial literacy study, white paper, and speaking tour. It’s an expensive proposition, but it can anchor a PR campaign and build credibility over years.